When you walk into the cinema to see Ocean’s 8 this month (and walk in you should), here’s what you should expect. Expect a heist film that’s stylish, captivating and a whole lot of fun. Expect an all-star cast of Hollywood’s best actresses playing one of the coolest, funniest girl gangs ever assembled on screen. Expect a film that walks the fine line between paying homage to Steven Soderbergh’soriginal trilogy, and doing its own thing. Gary Ross’s spinoff from the original Ocean’s trilogy is a crowd-pleasing heist comedy with the best cast of the year so far. The central premise is very similar to Ocean’s Eleven; Debbie Ocean (Sandra Bullock), sister to infamous conman Danny Ocean (George Clooney), gets out of jail, assembles a crew, and tries to execute one of the most ambitious heists of all time. However, this time the target is not the famed Las Vegas casinos, but the illustrious Met Gala; and the gang is no longer the testosterone package of Danny Ocean’s Eleven, but a gang of awesome ladies: Debbie Ocean’s 8. The plan: to infiltrate the illustrious Met Gala, and steal a $150 million-dollar Cartier diamond necklace from the neck of socialite and movie star Daphne Klugar (Anne Hathaway). The cast is incredible, and undeniably the best part of the film. 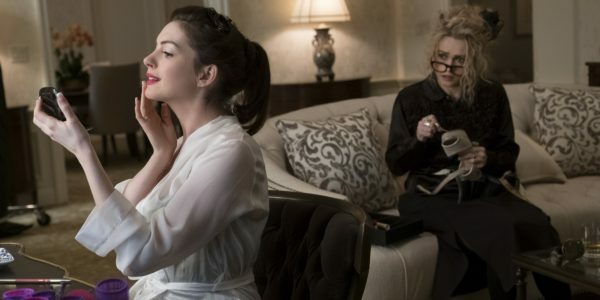 Certain narrative inconsistencies and script flaws can be ignored because of the charisma dripping off this entire cast (especially Anne Hathaway, Cate Blanchett and Sandra Bullock). Anne Hathaway is far and away the star of this film. She steals every scene and is clearly having a ball doing it. As a self-aware satire of the her stereotypical ‘diva’ persona, she is hammy as hell and I love her for it. Her hilariously caricatured performance is the best part of this film. Sarah Paulsonis also a welcome comedic presence as Tammy, a fence turned housewife who craves a return to thrill of the con (a nod to the character of Saul in the original trilogy, who “gets out of the game” only to be pulled back in). In the smaller roles, Mindy Kaling, rising star Awkwafina, and real life met-gala icon Rihanna, each make the most of every moment they are on screen, and bring very entertaining comic relief. Kaling, known for her comedy work on sitcoms like The Office and The Mindy Project, is in her prime here as Amita, an ambitious jewellery maker who wants to move out of her parent’s house. Rapper turned actress Awkwafina is another highlight as the pickpocket Constance. She has a small role, but through her distinct skater persona and hilarious line deliveries, she makes it memorable. Beauty and fashion icon Rihanna here plays against type as the sassy, nonchalant hacker ‘Nine Ball’. The one performance that didn’t really land for me was Helena Bonham-Carter. Playing Rose Weil, an out-of-vogue fashion designer who is five million dollars in debt to the IRS, Bonham-Carter embraced Weil’s ditzy eccentricity. However, the character’s goofiness felt out of place in this gang of cool, competent women. Where the film clearly differentiates itself from the original trilogy is the target of the heist. The Las Vegas Strip is a thing of the past, instead we’ve flown to the East Coast to hit the most exclusive party in the world. By reframing the focus from robbing casinos to stealing jewellery at the Met Gala, the writers (Gary Ross and Olivia Milch) successfully reflect the target audience of this female-led reboot. The film unashamedly leans into typically ‘feminine’ interests; fashion, jewellery and celebrity culture are all central themes of the heist. A plethora of celebrity cameos, access to the Metropolitan museum, and having Anna Wintour(Vogue Magazine Editor in Chief) as an advisor, all lend authenticity to this world of high fashion and glamour. The makers have put in real effort to create this illustrious world, and fill it with badass women. I’ve seen this film three times, and each time the credits roll, the majority female audiences leave on a high, chatting amongst their friends about how they love the film’s fun, its glamour, and its incredible cast of funny ladies. What I love about this film is how it smashes the fallacious Hollywood rumour that female-led movies don’t make money. 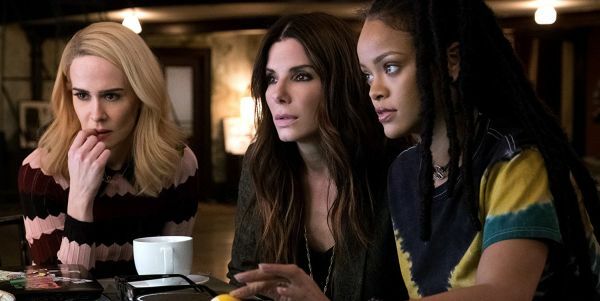 As Forbes recently reported, Ocean’s 8 made a cool $41.5 million on its opening weekend, easily beating each of the original trilogy’s opening weekends. The filmmakers have clearly made a conscience decision to lean into the comedy: and in that respect, it is largely successful. James Corden is a blast to watch as the meticulous insurance advisor. Richard Armitage is doing great supporting work as the comic villain character; his scenes with Hathaway and Bullock are both hilarious in different ways. The core gang all have such great chemistry and are clearly having fun here. Like the originals, this script is full of witty, underplayed one-liners, and Bullock and Blanchett quip these back and forth like the old friends Debbie and Lou are. The actresses with smaller parts are each milking the screen for all they’ve got, reminding us that “there are no small parts, only small actors” (Stanislavski). Where this film disappoints, is that it’s not content to be just a fun heist film. The writers clearly felt compelled to provide a second, more substantial motivation to the theft. They try to provide Debbie a revenge plot line that falls flat due to underdevelopment. Ocean’s Eleven , the 2001 George Clooney led casino robbery, had a well-established (albeit problematic) motivation behind it: for Danny (Clooney) to rob the evil casino mogul who “stole” his girl, Tess (Julia Roberts), and ultimately “steal” her back. If you can ignore the male entitlement that seeps through that script, and the atrocious underwriting of Roberts’ character, you can somewhat buy this premise. Clooney and Roberts had enough chemistry and joint screen-time for us to understand that Danny’s twisted plan had its origins in a love and care for Tess. This emotional depth made the viewers more invested in Danny’s success; they now had an extra reason for rooting for the good guy, past the pre-existing intrigue in seeing the heist completed. In contrast, Ocean’s 8 lacks this emotional depth. The setup involves Debbie getting revenge on an ex-partner who betrayed her when a dodgy art deal went south. Claude Becker, a smarmy, self-serving Richard Armitage, is set up as the target of this revenge narrative. The film’s justification for his victimisation is that Claude goes to jail for Debbie’s crime because Debbie went to jail for his. However, this is undermined by the fact that not enough story time is invested into making Claude a hissable villain vis-à-vis Andy Garcia’s Terry Benedict. The impact of Claude’s betrayal on Debbie is barely discussed. The cursory backstory is hastily covered through a flashback exposition dump, and a brief argument between Debbie and Lou. However, these moments, which exist to create audience investment in Debbie’s victory, feel awkwardly shoehorned between heist planning scenes. It is implied that Debbie and Claude had a romantic history, however this plot point is left purposefully vague (as is the sexual chemistry between Debbie and Lou). Had the script invested time into establishing the Debbie/Claude romance, Claude’s betrayal would have felt more devastating, and Debbie’s subsequent revenge mission felt more reasonable. Not to mention the fact that Sandra Bullock, Cate Blanchett and Richard Armitage are all excellent actors, very capable of emotional heavy lifting. It’s a shame this script doesn’t let them flex their acting muscles more. I think if the film had tried to be just a comedy heist caper, it could have had more success. Instead, the writers put a half-assed effort into making us emotionally invested, and instead land in an awkward middle ground between a revenge narrative with a satisfying conclusion (à la The Italian Job), and a broad comedy heist caper (à la A Fish Called Wanda). Styling A Spin-Off: To Copy The Past, Or To Shake Up The New? Stylistically, director Gary Ross has clearly tried very hard to recreate the original instead of shaking things up. And sometimes this works. Daniel Pemberton’s jazzy score massively contributes to the film’s fun, upbeat tone, and Eigil Brylds’s cinematography, with its in-camera zooms and pans, is a nice homage to Soderbergh’s work in the original trilogy. For the most part, however, Gary Ross is doing safe, solid, but uninspiring work. Ocean’s 8 lacks the effortless style of the original, despite its applaudable efforts to recreate it. Another technical flaw of this film is its very jarring editing by Juliette Welfling. Several scenes clearly ended up on the cutting room floor and it shows. Multiple moments from the trailers don’t make the film, and we already know that both Matt Damon and Carl Reiner (two of the original Ocean’s Eleven) had cameos that were cut in editing. These changes are understandable: at two hours the film is already getting long, and the final act does drag. However, if these changes had been made during script editing, not post-production editing, we might have avoided awkward, frustrating narrative gaps, and had a better flowing movie. Franchise Fatigue: How Do You Write A Spin-Off? The writing is where a bigger discussion about remakes, sequels and spin-offs needs to be had, especially in this wave of gender-bending remakes. How much should a spin-off resemble the source material? Should filmmakers give the audience more of what they loved, or try something new? Ocean’s 8 walks a fine line here. Some homages, like the cinematography and score, really work. And as a die-hard fan of the original trilogy, I loved the many sly references the script made to the originals: the opening parole board scene, initiatory restaurant meetings, laser sequences and cameos from members of the original cast. However, the Claude Becker revenge plot line, and the 11th hour twist, were both unnecessary, forced attempts to resemble the narrative structure of the original trilogy. Some writing elements, like the introduction of the leads through memorable and clever character vignettes, reflect the writers’ ability to both pay homage to the original, while still doing something different. Highlights include: Debbie conning her way into a 5-star hotel, Claude Becker and Debbie’s prickly reunion, and Awkwafina pickpocketing her way into the gang. Additionally, the decision to have eight leads, instead of eleven, allows each character to feel like a fully-fleshed out character, unlike the trilogy where periphery characters often fade into the background. 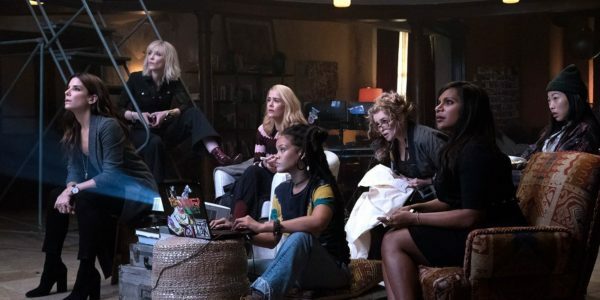 A fun-filled flick with an all-star cast of charismatic ladies having a blast; Ocean’s 8 is a stylish follow-up that captures the spirit of the original trilogy while still doing its own thing. Fans of celebrities, crime capers and Cate Blanchett in suits will love this playful, light-hearted and entertaining outing. While this doesn’t have the emotional weight of the original, the film thrives in this levity: embracing the fun without getting too bogged down in the details. It fits nicely into a franchise that’s main calling card is thrilling heists, witty, snappy dialogue, and a charismatic ensemble of Hollywood A-Listers. Admittedly, Ross lacks the directorial flare of Soderbergh; however, he still does an impressive job considering the challenges of world-building a sequel with a completely new cast. Issues related to editing and writing prevent this film from reaching its full potential; however, the stars are having so much fun that you still buy everything they’re selling (or would that be stealing?). 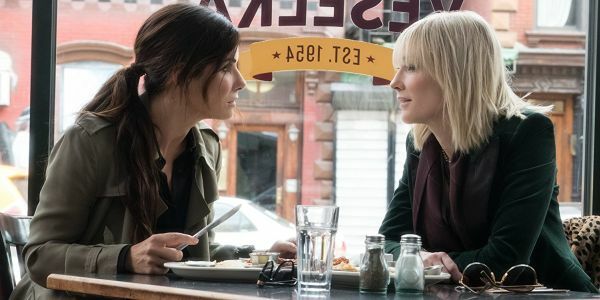 While Ocean’s 8 isn’t quite as slick as Ocean’s Eleven, fans of the original trilogy should not miss the latest instalment (it’s a definite improvement on the hot mess that was Ocean’s Twelve). Do yourself a favour, and treat yourself this week. Ocean’s 8 is a whole lot of fun, and with a cast like this, you don’t want to miss out. What is your favourite heist film? Ocean’s 8 was released on June 5th, 2018 in the USA and on June 18th in the UK. This article was originally posted on Film Inquiry.